Renault Renault F1 Grand Prix is committed for over 35 years with numerous success was the key, they have been acquired with the status of the manufacturer or engine. Renault Sport F1 is the structure set up by Renault to represent the brand in the World Championship Formula 1 FIA. Renault Sport F1's mission is to design and develop engines that can adapt to the car chassis partners RSF1 stables. At the end of the 1986 season, Renault decided to focus on the development of engines. Recognized innovator, the diamond becomes an engine supplier in its own right for several teams including the first Lotus Team led by Ayrton Senna. Between 1989 and 1997, Renault provides its blocks a Williams then Benetton, winning many victories and six consecutive constructors titles. 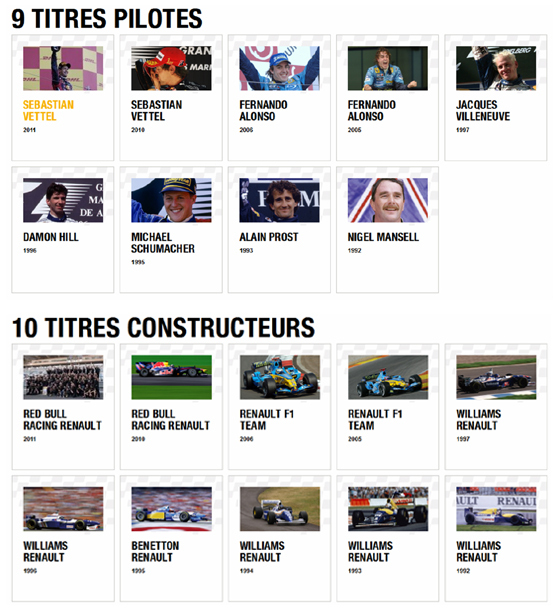 Much of the work of Renault Sport F1 is carried out at Viry-Châtillon (France), hub of Renault's F1 activities. It is in this factory in the south of Paris that were designed and produced the Renault F1 engine since the 1970s. Some stayed Famous as the Renault V6 Turbo, recognized as one of the most powerful being put on the track, the V10 Renault, who won six consecutive titles in the 90s, and the Renault V8, which has - has date - three constructors' titles. In total, nearly 250 people working at Renault Sport F1 to the development of current and future engines, helping to make Formula 1 a showcase of excellence for the brand.